(Lanka e News - 06.Oct.2018, 420AM) The head of the UN environmental programme (UNEP), former Norwegian environment minister Erik Solheim, pays too little attention to the environment, the regulations and budget of his office. Now the UN internal auditors have requested that he pays back part of the money he has spent on his trips. During his first 22 months in office, Erik Solheim spent 4,1 million Norwegian kroner (NOK), approximately 490 000 US dollars, travelling for 529 days around the globe. Many of these trips were allegedly made without sufficient documentation from Mr. Solheim that they were actually business trips. On two occations the 63 year old switched to a more expensive airline, causing extra costs of almost 60 000 NOK, according to the auditors. 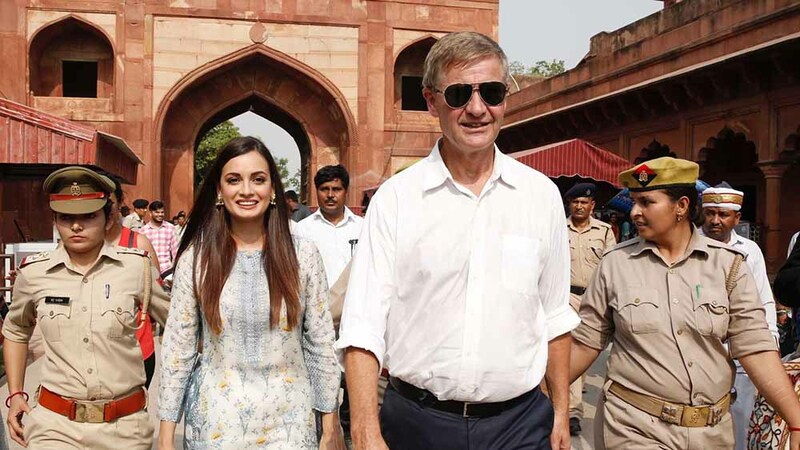 This emerges from the draft for a devastating report by the UN’s Office of Internal Oversight Services (OIOS) on the business travels of Erik Solheim and other senior UNEP staff. The draft was recently presented to Solheim, who may now respond and put forward possible corrections. A new version will then be prepared at a later time. When the UNEP management responds again, the OIOS will publish the final report. Erik Solheim, who at the moment is participating in the climate summit in San Francisco, did not wish to comment on the conclusions in the report, saying the document is just a draft. «We have responded and refuted a number of mistakes in this draft document. Based on our response the auditors will present a new draft. After we have commented on this draft, they will conclude their final report», said Solheim. The executive director did not wish to say what information he holds to be flawed. The OIOS did not wish to comment on the matter. «The auditing is still in progress, so we are not in a position to comment», according to an e-mail from the organisation’s spokesperson. The UN’s internal oversight services rarely changes the factual information or important recommendations from the first draft, according to a Norwegian source who is well acquainted with the UN system. In this first draft Mr. Solheim and two of his closest aides are being criticised for disorderly spending of official funds to such a degree, that they are being requested to pay back part of the money. «The UNEP and UN’s Nairobi office should reclaim from these employees (1) all travel expenses and the related working hours which have not been accounted for; and (2) all additional costs incurred by the UNEP as a consequence of uneconomic and inefficient decisions by the management», the auditors wrote. The former Norwegian environment minister, representing the Socialist Left Party (SV), Erik Solheim, caused some consternation last summer, by stating that Norwegians do not need not have bad conscience for traveling by plane. According to the OIOS he allegedly spent 79 per cent of his time at other places than the UNEP headquarters in Nairobi, Kenya. In total he allegedly spent 90 days in Oslo and Paris. 14 days were registered as time off or holidays, whereas the remaining 76 days were not accounted for, according to the draft report. «Some of the trips to Oslo and Paris were called «bilateral meetings», even though they took place during weekends or the Christmas holidays, the internal auditors said. They particularly mentioned an intercontinental flight over the Atlantic. «On one occasion he made an eight hour flight from Washington DC for a weekend in Paris, before he boarded another flight for New York», according to the report. The two other senior staffers were allegedly given permission by Erik Solheim to work out of Paris, in spite of being formally assigned to Nairobi. One of them allegedly received more than 165 000 NOK (20 000 dollars) in a special security allowance for Nairobi, in spite of being relocated to Paris. Permitting these leaders to work in Paris is a direct violation of UN’s regulations, according to the draft report. «Such arrangements will set the presedent for other employees who wish to work out of a place of their own choice, and probably lead to speculations about unfair treatment or claims when such request are being rejected», according to the UN’s watchdog body. The draft report indicates that the UNEP’s travel routines have been violated regularly in several cases. The trips were often badly planned and undertaken without approval from the relevant authority. Since 2014 the organisation’s travel budget has doubled. At the same time, UNEP achieved fewer of its goals than before. Between January 2016 and March 2018 UNEP’s staff made 27.458 travels at a total cost of 486 million NOK (58 million dollars), according to the draft. The UN’s environmental organisation does not pay enough attention to the environment, according to the auditors. «The management have not introduced guidelines, routines or incentives for their staff when it comes to controlling their travels and consequently the carbon emissions. Employees have not been encouraged to find alternative ways of traveling», said the OIOS, stating that several other UN organisations have taken measures to reduce emission of greenhouse gases. The internal auditing concerning Erik Solheim and the UNEP were allegedly started after employees at the head office in Nairobi sent a letter of warning this spring. Several staff members are said to be frustrated at Solheim’s style of leadership, and the fact that he is very rarely present at the office. Aftenposten has learned that Solheim’s travels have been vehemently discussed at the headquarters as well as at a number of foreign embassies in the Kenyan capital. The matter has apparently been a cause of concern even in the Norwegian Foreign ministry. The UN’s internal oversight system can be compared to Norway’s National Audit Office. It is considered a very important and serious UN institution, according to former UN top official Hilde Frafjord Johnson, who is presently Secretary General of the Christian Democrats, one of Norway’s political parties. She did not wish to comment on this specific matter. Erik Solheim and other UNEP leaders are allegedly frustrated at what they perceive to be a cumbersome bureaucracy, according to the OIOS-draft and several other sources Aftenposten contacted. «The management were willing to bypass a set of rules which they considered to be «bureaucratic» and «political», according to the draft. Among other things these rules require every employee to report business trips at least 21 days before departure. «It is pretty obvious that Solheim and other senior UN staffers cannot follow such rigid rules,» a Norwegian UN official told Aftenposten. Many of the sources contacted by Aftenposten concerning this matter, find the accusations against Erik Solheim very serious. Most of them talked on the basis of anonymity, but not the leader of Greenpeace Norway, Truls Gulowsen, who commented on the UNEP-leader’s extensive travels and lack of routines for emission of greenhouse gases.